How Scrum Team Can Work Together Effectively? Openness about work and any challenges that might come up. Scrum consist a series of sprint or development iteration. Each scrum sprint involves the same process: Role (people), Events (meetings) and Artifacts (tangible by-products). Sprints are development cycles that repeat until your project is complete. Requirements (often in the form of user stories) are developed, tested, integrated, and approved within each sprint. And the process continues sprint after sprint. The Scrum framework is defined by three core roles: the Development Team, the Scrum Master, and the Product Owner. The Scrum framework is marked by five Events. These are the Sprint, Sprint Planning, Daily Scrum, Sprint Review, and Sprint Retrospective. 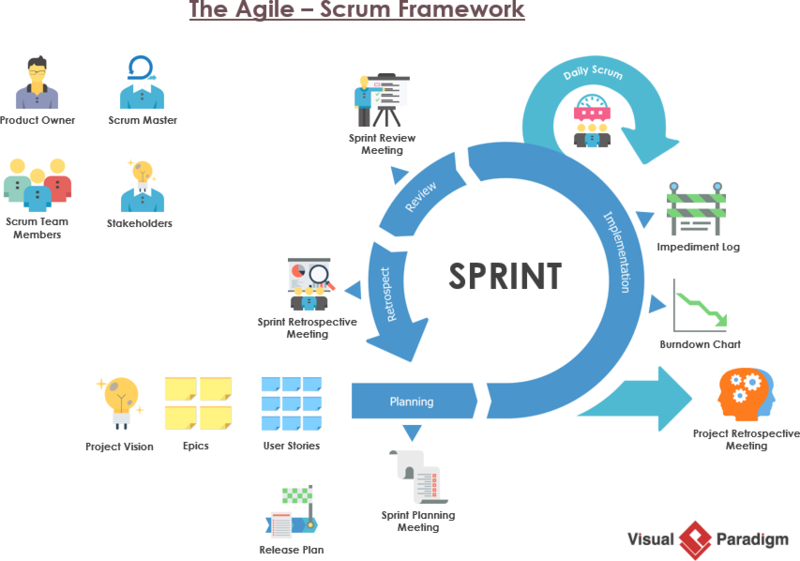 A sprint (also called an iteration) is the basic unit of development in Scrum. The sprint is a time-boxed effort; that is, it is restricted to a specific duration. The duration is fixed in advance for each sprint and is normally between one week and one month, with two weeks being the most common. Sprint planning is an event in the Scrum framework where the team determines the product backlog items they will work on during that sprint and discusses their initial plan for completing those product backlog items. A daily stand-up (also called daily Scrum meeting) is a short organizational meeting that is held each day. The meeting, generally limited to between five and fifteen minutes long, is sometimes referred to as a stand-up, a morning roll-call or a daily scrum. The Sprint Review takes place after a Sprint ends. During Review, the Product Owner explains what planned work either was or was not completed during the Sprint. The team then presents completed work and talks through what went well and how problems were solved. The Sprint Retrospective is held after the sprint review at the end of each sprint. It offers the team an opportunity to inspect itself and create a plan for improvements to be enacted during the next Sprint. Artifacts are just physical records that provide project details. Scrum Artifacts include the Product Backlog, Sprint Backlog, and Product Increments. The Product Backlog is a prioritized list of features, defects, or technical work that has yet to be worked on. It should be work that is considered valuable from the product owner’s perspective. The Product Owner and the rest of the team work together to review the Product Backlog and make adjustments when necessary, as product requirements change and evolve. The Sprint Backlog is a list of all items from the Product Backlog to be worked on during a Sprint. This list is put together by prioritizing items from the Product Backlog until the team feels they’ve reached their capacity for the Sprint. Team members sign up for tasks in the Sprint Backlog based on skills and priorities, following the self-organizing Scrum framework. A Product Increment is the sum of product work completed during a Sprint, combined with all work completed during previous Sprints. The goal of a Sprint is to produce a Done Product Increment. It’s up to the Scrum team to agree on what defines an Increment’s “Done” status, but all team members need to agree on and understand the definition. The Scrum Lifecycle starts with a prioritized backlog, but does not provide any guidance as to how that backlog is developed or prioritized, which consists of a series of Sprints that yield the end result as a potentially shippable product increment as shown in the Figure below. The business sets the priorities and the team organizes themselves to determine the best way to deliver the highest priority features. The Product Owner represents the Business side and is responsible for the maintaining the list of product features wish list called a product backlog and sets priorities for development. 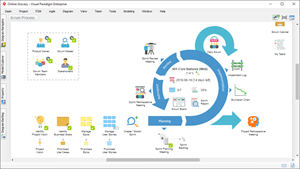 The Scrum process is based on iterative cycles called Sprints which typically last 2-4 weeks during which the product is designed, coded and tested, while meeting every day to assess its progress (daily Scrum). At the end of the sprint, the work should be potentially shippable for showing to a stakeholder. The sprint ends with a sprint review and retrospective meetings. The project will either goes on until it is completed the entire wish list, or it will be stopped due to the time or budget has already been exhausted. This goes on until the project is deemed complete, either by stopping to work (deadline, budget, etc.) or by completing the entire wish list.